I gave two of my dogs these formulas and saw amazing results! My rescue Chihuahua (who was terribly abused) was diagnosed with a luxated patella in her left leg that my vet said would require surgery. After using this formula for two weeks, I noticed a significant improvement in her condition. She has been on these formulas for a couple of months now and hasn't had any problems or episodes of pain and limping. We spent the day outback a few days ago and were shocked and pleasantly surprised to see her run around the yard with the other dogs...hence her name, Zippy! It was amazing to see her run (and fast!) and play!!! Never knew she had it in her! 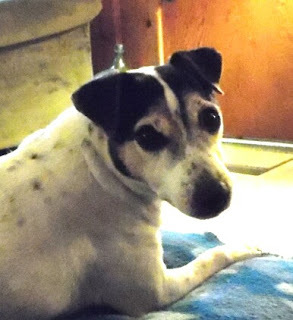 My other dog Winston, the Jack Russell in the picture, has been diagnosed with herniated discs and seeing his x-rays showed that he had to compressed discs. Poor thing was in severe pain and constantly shaking. He was started on these same formulas and even though it took a little longer, I have seen improvement in him. He is still a little slow and occasionally shows his pain and age, but it's wonderful seeing him wagging his tail and participating in play outside, even if it's only for a little while. His final years will be as happy and pain-free as they can be thanks to these amazing formulas. I gave two of my dogs these formulas and saw amazing results! My rescue Chihuahua (who was terribly abused) was diagnosed with a luxated patella in her left leg that my vet said would require surgery. After using this formula for two weeks, I noticed a significant improvement in her condition. She has been on these formulas for a couple of months now and hasn't had any problems or episodes of pain and limping. We spent the day outback a few days ago and were shocked and pleasantly surprised to see her run around the yard with the other dogs...hence her name, Zippy! It was amazing to see her run (and fast!) and play!!! Never knew she had it in her! My other dog Winston, the Jack Russell in the picture, has been diagnosed with herniated discs and seeing his xrays showed that he had to compressed discs. Poor thing was in severe pain and constantly shaking. He was started on these same formulas and even though it took a little longer, I have seen improvement in him. He is still a little slow and occasionally shows his pain and age, but it's wonderful seeing him wagging his tail and participating in play outside, even if it's only for a little while. His final years will be as happy and pain-free as they can be thanks to these amazing formulas.